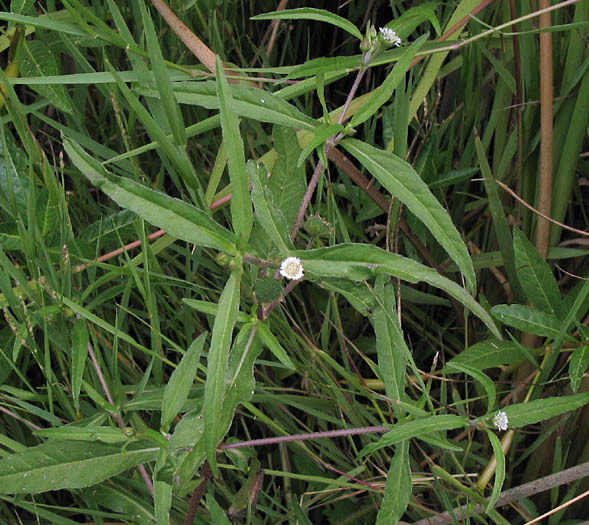 Eclipta prostrata plant. Santa Monica Mountains National Recreation Area. smmflowers.org (Accessed 4/2018). 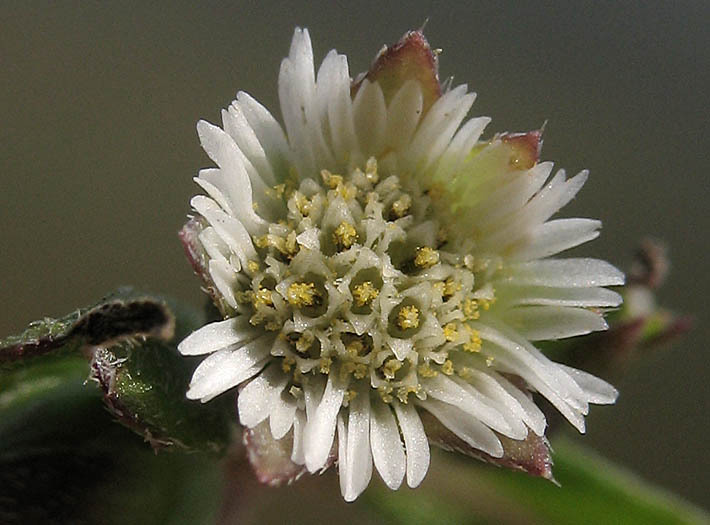 Eclipta prostrata is an annual, 20-60 cm, often reclining, freely branching, often rooting at nodes, rather fleshy, finely rough-hairy, stems green to reddish, leaf bases often joined across stem as a line or ridge, appearing jointed. Leaves opposite, stalkless or short-stalked blade lance-shaped to elliptic, 2-10 cm long, 0.4-2.5 cm wide, tip pointed, usually hairy on both sides, margin few-toothed. Eclipta prostrata flower. Santa Minica Mountains National Recreation Area. smmflowers.org (Accessed 4/2018). Flowers in button-like heads, ray flowers whitish, 0.1-0.2 cm long, disk 0.4-0.6 cm wide, flowers white to greenish, basal bracts often longer than flower head; inflorescence of 1-3 heads in terminal or axillary clusters. Eclipta prostrata fruit. By John Gwaltney. Copyright © 2018 John Gwaltney. Southeastern Flora – www.southeasternflora.com (Accessed 4/2018). 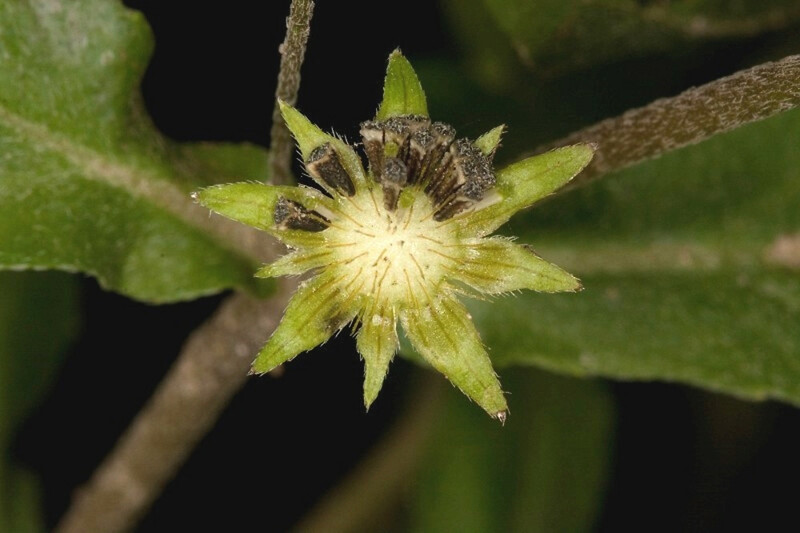 Fruit dry, 1-seeded achenes about 0.2 cm long, rough-warty surfaced, 3-4 angled, black to tan with a very short crown around the flattened apex; flower head much wider in fruit, about 0.8 cm, green; blooms and fruits Aug.-Oct. (Uva et al. 1997). Habitat: Open, disturbed moist to wet soil, pond edges, wet fill, damp roadsides, soil pH 5.2-7.9 (USDA, NRCS 2006).